Cores are Styrene-based foams, commonly (and erroneously) referred to as "Styrofoam", either beaded (the majority, bigger boards have vent screws), or extruded (a bit heavier). Throughout this site, I will refer to this material as "EPS", expanded polystyrene, and "XTR", extruded polystyrene foam. Because EPS and XTR foams melt with exposure to Styrene, boards are put together with an Epoxy, most of which have no solvents. 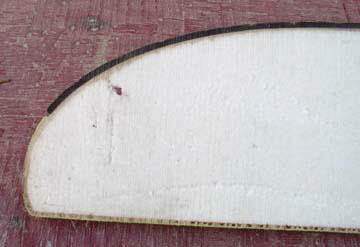 Painted boards use "normal" Epoxies, while clear-finished boards use (or should use) UV-resistant Epoxies. There are many different Epoxy formulations for special applications. Most repair jobs will use room-temperature-cure. All Epoxies have a very specific mixing ratio of resin to hardener, and deviating substantially from this mixing ratio will make for a gooey mess. Unlike Polyester resins, which can be accelerated by adding more catalyst, Epoxy resins can only be accelerated by using a faster hardener (or by heating them - but that's a different story). Reinforcements (the stuff that provides the strength) are either fiberglass of some type or another, or Carbon, or Kevlar®, or combinations thereof. Fiberglass is an all-around material that does nothing particularly well, but has no glaring shortcomings, either. Carbon is enormously stiff for its weight, but quite weak in impact. Kevlar® handles impacts extremely well, but is an utter pain to work with. All these reinforcements come in a variety of arrangements, from random chopped-strand-mat, to woven cloths, to unidirectional tows. 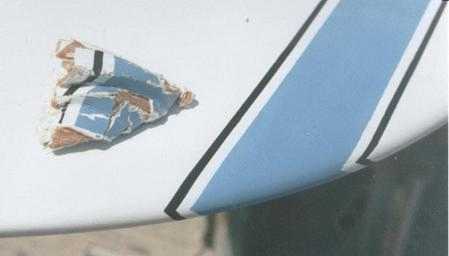 Some combine different raw materials, to tailor the composite to best handle particular loads. To improve panel stiffness (decrease heel denting and such) most boards these days have some sort of sandwich structure. This will consist of either a linear or cross-linked PVC foam (Airex or Divinycell, respectively), or wood veneer inserts, or a combination thereof. A cheap substitute is Coremat, a blanket-like material that absorbs much resin to gain bulk and stiffness. I don't see many boards with it anymore. Honeycomb cores were en vogue for a while, but have - fortunately - fallen from favor recently, due to their propensity to take on prodigious amounts of water. Where major local loads need to be accommodated, all boards have (or should have) inserts surrounding the fixtures. 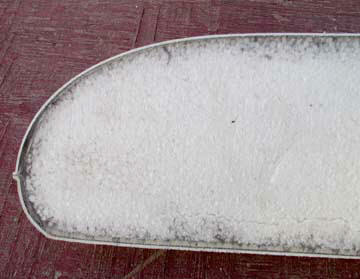 These inserts are commonly made from Divinycell or high-density Urethane foam. Current state-of-the-industry: EPS foam core, inner glass, Divinycell, outer glass, paint. Fancier boards substitute Carbon, and may throw in some veneer, but basically, this is what most good Epoxy sandwich boards look like these days, be they surf, windsurf, or kiteboards..
Surftech wood veneer board: EPS foam core, inner glass, structural wood veneer. 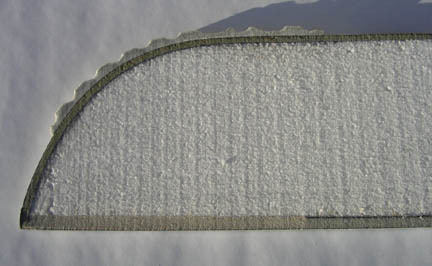 Economy construction: non-woven fiberglass reinforcements (usually with a token unidirectional strand thrown in someplace), with tough ASA skin. Ideal for rentals and such, but heavy and lacking stiffness. Surftech Softop. 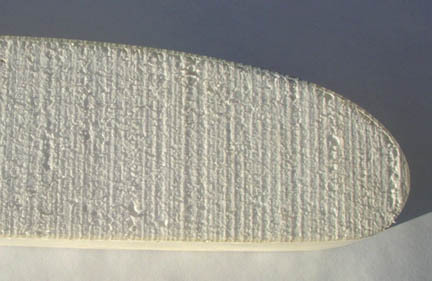 EVA foam padding distributes deck loads, making for a fairly dent-resistant single-skin construction. Strong and tough while relatively light - favorites with rental places.